The warehouse is a vital installation for the activities of any company, regardless of the sector to which it belongs. Its need is evident for the storage, custody, verification and provision of goods within the supply chain. However, optimal organisation of operations and available resources make the difference, i.e. providing higher quality service at the lowest possible cost. In this regard, the incorporation of a management and control software increases performance, provides a much more efficient work system, and minimises errors. The main objective of warehouses is to regulate the differences between the inflows (that which is received from suppliers, production plants, etc.) and outflows of stock (products that are sent to manufacturing centres, to point of sale locations, etc.). To achieve this objective, different tasks should be developed: receipt of goods, verification, internal transport between different areas, storage, preparation of orders, consolidation of loads, dispatch and obtaining information concerning stock, workflows, demand, etc. From a business point of view, all these functions should be run efficiently and at the lowest possible expenditure to improve competitiveness. The WMS helps organise real-time product flows within the warehouse, as well as manages stock and inventory. The system with the most suitable benefits will be installed depending on the size of the warehouse, its complexity, the number of personnel, and the logistical needs of the company. We recommend the WMS for controlling stock even though few products are warehoused. It is indispensable when large numbers of SKUs coexist. 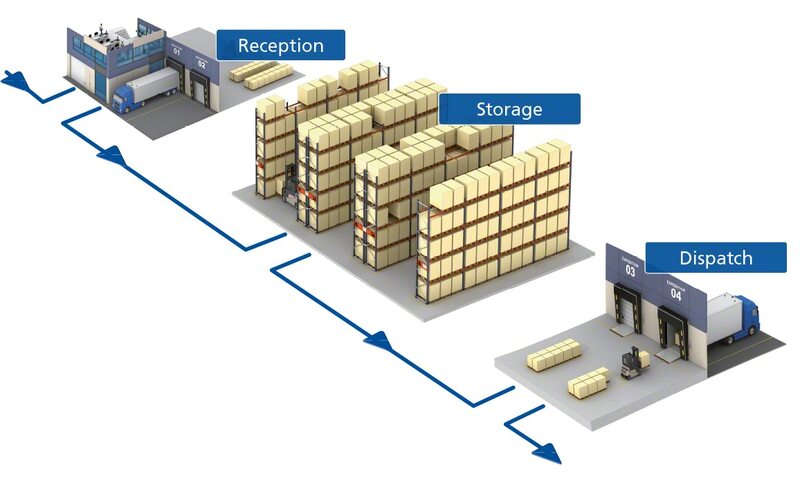 The correct management of processes, tasks, resources and elements that participate in a warehouse’s daily operations translates into an increase in physical storage capacity. It also improves productivity and the quality of service offered. Order is paramount in a warehouse and has a direct impact on all the activities being developed in it. This includes the work of operators, the management of stock, resources, workflows, etc. In a disorderly warehouse, there are no areas or locations assigned to products. When this practice occurs in medium or large sized facilities, with several operators and movements at the same time, errors ensue and time is lost locating items and preparing orders. The programme organises locations based on strategies and rules, and identifies the containers and products from their reception. It has the capacity to give instructions to operators, indicating where to deposit or extract the goods. What can occur is that movements are not coordinated, and each worker uses their own judgment without any prior notice or forethought. 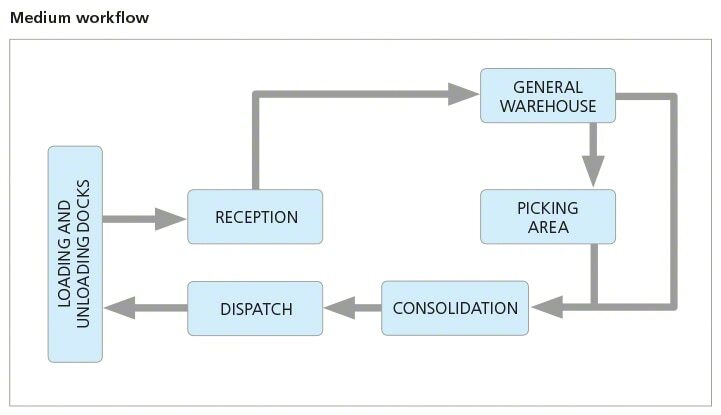 In this situation, it is common that many operators intersect at the same location or aisle and may coincide with several handling machines at the same time, such as forklifts. This hinders workflows, the possibility of accidents increase and performance decreases substantially. The WMS is responsible for directing all movements, and operators only need to perform and confirm the assigned actions. It also manages the number of machines, which may overlap in the same zone, the areas where they are allowed and the tasks for each worker to perform. The optimal organisation of activities increases productivity. Out-of-stock means the absence or scarcity of products. Due to the lack of foresight, orders cannot be completed and therefore cannot be delivered to customers because there are neither sufficient goods nor enough time to respond. In order to avoid this situation, the WMS is integrated with the enterprise resource planning system of the company (ERP). It verifies stock in real-time and makes relevant decisions in advance. It sends notifications and indicators relating to the status of stocks and obtains tighter control of the location of the goods. All the SKUs must leave the warehouse as soon as possible; the higher the turnover, the more the company will earn. However, bad management due to lack of information may cause excess or lack of stock, which involves financial losses due to stock outs, temporality or obsolescence. The WMS organises the products inside the warehouse based on different rules and criteria such as the FIFO, LIFO, FEFO, etc. 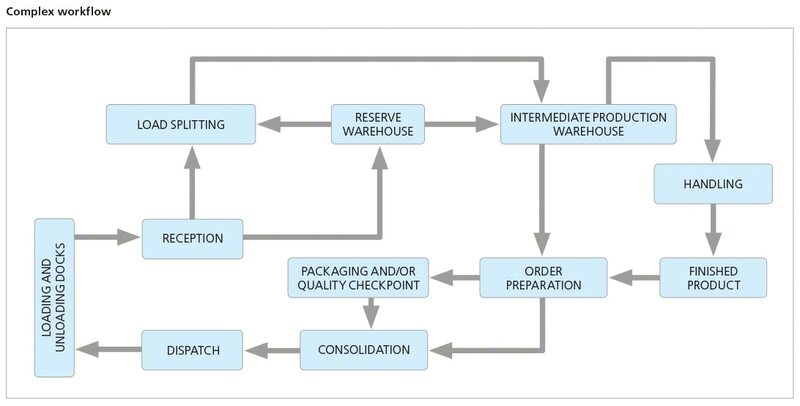 Order preparation is one of the most striking features of the activities that take place in a warehouse, because it can exceed 50 or 60% of the operating costs. The greater the splitting of load units, the greater the cost. When performing picking, mistakes are possible, such as: selecting the wrong quantity of products, dispatching one item instead of another, confusing orders, loading them on the wrong transport vehicle, etc. These errors generate returns and expensive second deliveries, and cause mistrust with customers. Generating preparation lists, order by order and in groups. Management of orders by waves. Segmenting orders by preparation areas. Organising a prep list adopting streamlined routes. Guiding operators in all operations that must be performed. Generating labels and dispatch documentation. Automatic recording of all the operations performed by each worker. Obtaining reports on performance and the various operations. While the chosen WMS contains the functions provided for in the initial project, there must be other operating modules, which allow easy expansion of capabilities in light of future process changes. For example, in recent years there is a revolution within the logistics industry due to the boom in e-commerce businesses. These companies sell a wide variety of products in small quantities that are rush-delivered. Suppliers must then deliver stock on deadlines, which in many cases are less than 24 hours. Companies must adapt to this new situation, seeking solutions to speed up order prep with optimal operations and without skyrocketing costs. A good WMS should facilitate this type of company development, enabling its safe and quick updates. The warehouse management program Easy WMS developed by Mecalux Software Solutions provides great advantages in improved management and in quality customer service, as well as in lower logistics costs. It minimises the time in a multitude of tasks within the supply chain, from inventory taking, to cross docking and the movements of operators. The software is highly parametrisable, can be customised and adapted to each warehouse’s requirements and characteristics. It is also possible to select a level of complexity, and then modify it according to the expansion of the business. In the case of automated warehouses, the Galileo control module is responsible for giving the movement orders to the various devices inside the installation such as stacker cranes, conveyors, electric monorails, etc. Easy WMS by Mecalux is in constant evolution and has the possibility of being cloud-based ― an integration modality that foregoes the use of physical servers. This solution provides high security without having to depend on computer equipment, and allows access to information from any location. It also minimises maintenance costs, which are borne by the supplier. Providers such as Microsoft, SAP and Oracle endorse the quality and efficiency of the Mecalux software. These references show that the Easy WMS is a warehouse management system with top-notch, dependable technical quality in the logistics sector. Easy WMS also boasts a very clear and intuitive user interface design.